India’s first ever contest to appreciate, recognize and reward the contemporary Indian women for their homemaking skills. 1. Contestant is eligible to compete in a state pageant in which she is either a resident, owns property, or is employed in said state. 2. Contestant is eligible if she works in said state. 3. Entrant must be married a minimum of 6 months by 1st of Jan, 2019, and must be residing with spouse. 4. Contestant must be a least 21 years of age by Jan 1st 2019, and no older than 60 years of age. 5. Contestant must be an Indian citizen and a six-month minimum resident in the state of her entry, or attend college or own property in that state. 6. Contestant must be a born female married to a born male. Simply fill in the form online to be a contestant for Mrs. Homemaker 2019. Download the PDF form to send us the hard copy of the form directly on our address. The whole event is well planned to ensure full participation and involvement of all the candidates along with their families. Each day is going to be a fun filled one with various sub contests going on for choosing various title holders. With each passing day some candidates will get eliminated and for the Grand Finale, the top 25 scorers will compete with each other for the main title Mrs. Homemaker and the first and second runner up titles respectively. This round consists of an interview session of all the 2,000 short listed candidates. A panel of judges would be set up to carry a preliminary interview session of the short listed candidates. Each candidate will get to spend 8-10 minutes with the judges. On basis of this interaction 200 candidates will be selected for the next round which will be conducted on day 3. Day 3 will start off with detailed and elaborate interviews conducted by a panel of judges who will ask the contestants various questions regarding different aspects of their life. Questions will not be too personal or intimate, capable judges would ensure that sentiments of the candidates are not hurt in any ways. The interaction will be a short conversation of 10-12 minutes. The Talent Round will be held alongside the Personal Interaction Round. Talent Round aims to identify any special hobby, art or interest that you have. The talent on display may relate to poetry, painting, singing or dancing etc. The combined result of Personal Interaction Round and Talent Round will decide the 50 Top scoring ladies. These top 50 scorers of these rounds go ahead to Day 4 of the contest. ** A shrewd budgeter will surely prove to be great Homemaker. And the Financial Planner title goes to the lady who manages her finance judiciously and intelligently. ** To judge your spending, saving patterns in running your home, you would be presented with different scenarios. ** A well thought out solution to the given situation can get you the prized crown of Mrs. Financial Planner. ** On same lines Best Holiday Planner will be chosen. Simple questions such as where you would take your family to and why can get you the prize. This round will witness full participation of all the family members. A decision regarding a good wife, mother and daughter-in-law cannot be arrived at without an interaction with the whole family. Therefore this round will involve in camera interviews and talks with all the members of the contestant’s family, which will further ensure the contestant’s berth in the 25 finalists. ‘A home is known by the woman who keeps it’. Now will be the time for these contestants to show off their sense of color, design and decoration. Food makes the world go round. The old saying that the way through a man’s heart goes through his stomach still holds true. This round will provide the contestants the opportunity to reveal their culinary abilities and skills. You get to cook a dish or two and our celebrity chef will decide on the title of Mrs. Kitchen Queen based on the taste, flavour and the presentation of your dish. ** This is the big day for which we all have been waiting. This is the day when Mrs. Homemaker 2019 would be crowned. ** For the final day all the contestants will walk the ramp in front of the judges and esteemed invitees. ** They have to answer simple question put up by one of the judges. ** The most talented, elegant woman with the maximum score wins the crown of Mrs. Homemaker 2019. 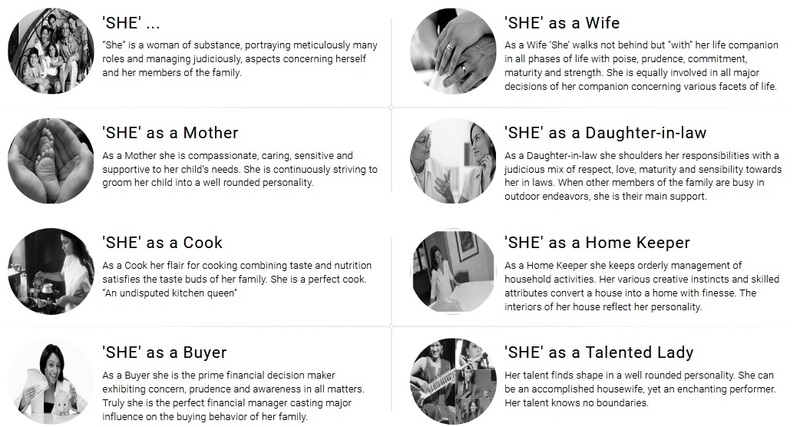 What is Mrs. Homemaker Contest all about? This is an effort to thank Homemakers for the many roles they play effortlessly in our lives. Is it another Beauty Pageant? ** No, this is not a beauty pageant for sure! ** Because we at Phoenix believe that womanhood is much more than external beauty. ** There are other parameters too on which they would be judged. What are the titles up for grabs in Mrs. Homemaker Contest Chandigarh Tricity 2019? These are the titles and subtitles up for grab in Mrs. Homemaker Chandigarh Tricity Contest 2019.
Who all are the esteemed judges for the mega event? ** The Mrs. Homemaker Contest is all about Homemakers and to facilitate and appreciate you we have well known celebrities, achievers as our celebrity judges. ** Our panel of judges is who’s who of art, culture, literature, fashion and politics. Eminent personalities from various fields will grace the occasion. ** The judges themselves are achievers in their own field and serve as an inspiration for people like us. What do I achieve by being a part of Mrs. Homemaker Contest Chandigarh Tricity 2019? ** It’s an event that promises to change your life forever. Mrs. Homemaker Contest Chandigarh Tricity 2019 is an event that gives you a chance to mark your presence with a bang. ** It is a platform that brings out your potential, skills and talent. ** The big scale event, its various activities make you aware of your importance, significance to your family, friends and the society.